Due to the fact that I nanny full time for the summer, I wanted to find a product that was super quick, easy and waterproof to throw on in the morning before heading out. There really isn't much point in wearing a lot of makeup when you are playing with kids all day, but a little shimmer never hurt anyone :-). I had seen these eyeshadow crayons at Sephora and I thought it would be a perfect, hassle free option. You can throw it on, no brush or messy fingers involved, and it should stay on all day. 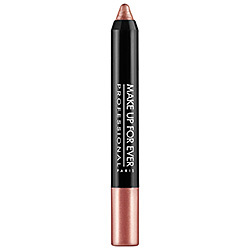 I generally love Makeup Forever products so the first product I tried was their Aqua Shadow eyeshadow pencil in 26E Pearly Peach. I had really high hopes for this because their Aqua Shadows in the jars are amazing. Unfortunately, this product was a disappointment. First of all, I was not crazy about the color when it was on my eye. It was beautiful swatched on my hand, but on the lid it looked too orangey for my taste. Second, instead of going on smoothly and effortlessly, it went on sticky and I had to really color it on to get the payoff I wanted. After it was on, it looked patchy and just bad. This product did have good staying power, but that isn't really helpful when you don't like how it looks to begin with! After trying to like this product for a few days, I brought it back to Sephora and exchanged it for the same thing but by Urban Decay (24/7 Glide On Shadow Pencil) in the color Lit, a golden bronze. 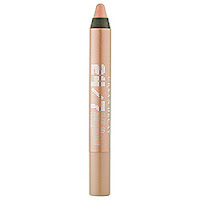 Just like the MUFE pencil, this pencil boasts all day wear. It swatched so smoothly on my hand that I thought it was a definite improvement from the MUFE pencil. The color was definitely better and more along the lines of what I wanted, however, when I tried it on the lid I had the exact same problem as I did previously! The pencil was so tacky and I had to rub and rub to get a uniform color. Just like before it came out patchy....again, it stayed on really well but that was it. Well, I wasn't about to give up because I wanted an eyeshadow crayon and damn it I was going to find one! So I proceeded to bring back the UD pencil and try the NARS Soft Touch Shadow Pencil in Goddess. It swatched well, as the others did, so I brought it home. Out of all the pencils, this one has had the best consistency. It glides smoothly on the lid and does not leave the tacky, patchiness that the others did. The color is really lovely as well. The staying power isn't nearly as good as the others, even with a primer, but for now, its a keeper! I know, the lengths I will go through to find the product I want is pretty crazy, but I just hate to settle on bad makeup especially with how expensive it can be. I return 99.9% of the products I don't like which helps to decrease clutter and make my makeup collection full of quality stuff. I hope this helped for anyone in the market for a shadow pencil and if anyone has tried a drug store version please let me know! !